David Charlesworth’s mastery of both hand and machine tools comes from meticulous preparation, and here he explains his approach in precise detail, enabling even the newcomer to achieve professional results. Full instructions are given for sharpening, fine-tuning and using hand tools – including bench planes, marking gauges and chisels – and even for making items such as spoke shaves and winding sticks. Learn how to fine tune the bench plane, prepare Japanese and European chisels, cut plain, secret and twisted dovetails, plane a true face and edge, rout sliding dovetails, make accurate tenons, dowel joint carcases, male a work bench, and much more. This book will set beginners on the right path, help the more experienced to develop their skills, and challenge expert woodworkers to re-examine their methods. Everyone who uses tools to work wood, and cares about accuracy, will find David Charlesworth’s advice both fascinating and useful. “The gnat’s whisker is a universal measure for woodworkers, defining our boundaries of accuracy…..David Charlesworth works with the sveltest of gnats….. 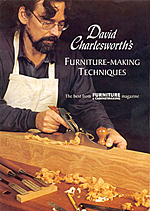 In this companion volume to his successful ‘Furniture making techniques’, David takes a fresh look at a range of inspiring projects and expert techniques originally presented in Furniture & Cabinetmaking magazine. His own highly regarded work is featured, as are pieces produced by several of his talented students. As ever, David’s approach is a holistic one; a combination of the analytical, practical and innovative. He challenges the beginner, more experienced woodworker and expert craftsperson alike, to employ the same meticulous approach to their designs to produce exhibition quality results. Fine cabinet making is a fascinating and challenging discipline and – as David believes – there is always more to be learned. This second authoritative volume, then, is certain to become an invaluable addition to the workshop. 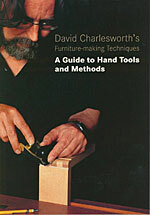 In this indispensable new guide to the basic principles of furniture making, David Charlesworth reinforces his status as a dedicated commentator and teacher of the craft. This book is an ideal workshop accessory, with easy to follow instruction on the use of handtools and how to build confidence and creativity with new, or maybe just rusty techniques. Designed to encourage the complete beginner and challenge the student or keen amateur, all woodworkers will glean inspiration from the sound knowledge and advice within these pages. Includes sections on: Sharpening, finishing, marking and measuring, techniques in action, planes, spokeshaves and chisels. Our corporate web site experts encourage us to write as briefly as possible when speaking to an Internet audience. So with that in mind, here is my review of David Charlesworth’s new book, “A Guide to Hand Tools and Methods” (Guild of Master Craftsman). It’s a fantastic book. Really worth buying. And it ties up all the loose ends from his first two books on furniture making. So with that out of the way, here is the giant footnote to the above review. I first met David Charlesworth during his first visit to the United States about four years ago. He touched down in the cornfields of central Indiana to teach a class at the Marc Adams School of Woodworking and then shoot his first video on sharpening with Lie-Nielsen Toolworks. It was a hot spring, and David was still tired from traveling but was happy to go to dinner with Tom Lie-Nielsen, Mario Rodriguez and me. After some searching, we ended up at Texas Roadhouse, a Western-themed chain restaurant where they eat peanuts and throw the shells on the floor. I ordered a beer. Thomas ordered a gin and tonic, I believe. David asked for the wine list. Somehow we didn’t get hassled that night, and David plunged into the menu with surprising gusto, ordering the “rattlesnake bites,” which are deep-fried jalapeno peppers and cheese with a Cajun horseradish sauce for dipping. That is not your typical Devon, England, fare. David’s willingness to fearlessly try new things is one of the traits of his work as a woodworker, teacher and writer during the last 30 years. He mixes a deep drive for precision woodworking with a self-confessed laziness (which I think is a bit of a stretch). The most famous example of the result of this approach was “the ruler trick,” a way of preparing the unbeveled face of a plane iron with the help of a ruler. It removes hours of tedious labor and produces a spectacular edge. 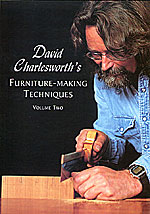 I purchased David’s first two books (“David Charlesworth’s Furniture-Making Techniques” volume one and two), before I met him. I’d pored over them because they were so different than every other book on hand work. He went into far more detail on preparing and using tools than any other source I could find. His techniques were simple, but they required great discipline and attention to detail. They didn’t rely on years of training your hand and eye, just a willingness to pay close attention. David’s third book continues in this same vein. Like the first two books, “A Guide to Hand Tools and Methods” is a collection of his columns from Furniture and Cabinetmaking magazine. So the book hops around from topic to topic a bit. There are four chapters on tuning planes, three on spokeshaves but one on chisels. However, when read with the other three books, “A Guide to Hand Tools and Methods” feels much more like a cohesive whole. It fills in many small details that are important to accurate work, such as the chapter on how to true waterstones. His chapters on marking and paring dovetails will help many woodworkers who have been bewildered by the varying approaches available. And there are chapters on little bits of cleverness that Charlesworth has developed, such as an ingenious adjuster for a spokeshave designed by Brian Boggs, and how to alter a marking gauge to use a pencil in place of a pin. With all three books now in print, I wish that they could be combined and re-organized into one consistent volume so you could get all of the sharpening techniques in one place, all the plane tuning articles in one place, all the sawing advice in one place. Perhaps some day. Until then, “A Guide to Hand Tools and Methods” is really worth buying. And it is a worthy successor to his first two books on furniture making. And as I read the last chapter in the book last month, I started wondering where David would go next with his teaching and writing. Would he apply his same insight to preparing other tools that vex woodworkers, such as profiles of moulding planes or carving tools. Would he delve more into the vast unexplored area of design? Or the equally vast forgotten realm of traditional casework?